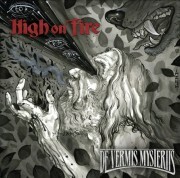 Epic doom metal gods High On Fire have released yet another single from their upcoming album De Vermis Mysteriis. The song is called “Bloody Knuckles” and you can find it streaming right here. De Vermis Mysteriis means “mysteries of the worm” and is an amazing reference to writer H.P. Lovecraft. It is due to be released April 3 via eOne Entertainment and Frontman Matt Pike has said that you should, ”Prepare for your dark journey.” You can find more about the album right here. The first single from the album called “Fertile Green” can be found streaming here if you haven’t heard it yet.